The small community or "census designated place" of Aguanga (population 1,128 as of the 2010 census) encompasses an area of about 13.6 square miles at the intersection of State Route 79 and State Route 371 (Cahuilla Rd.) approximately 18 miles east of Temecula. We've driven SR 79 a number of times en route to Anza Borrego State Park, and have only trekked a short stretch of SR 371, which connects to SR74 to Hemet/San Jacinto or all the way to Palm Desert & Indio in the Coachella Valley. 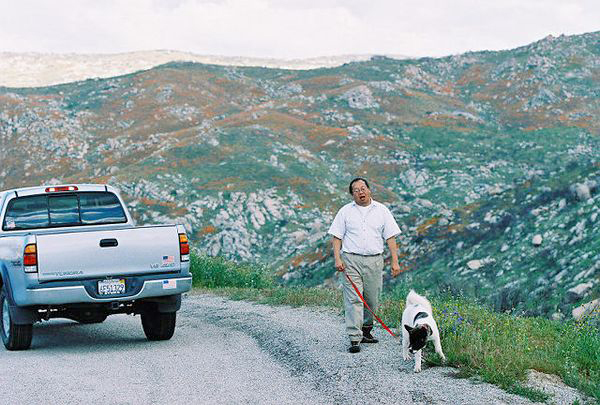 Back in 2005, a year before we moved to Murrieta, we took a day trip with our then 5-month old Akita, Hana, to the Aguanga area to see if there were any wildflowers blooming in the vicinity, and boy, were we speechless (at least I was) when we came upon the multitude of blooms carpeting the roadsides and hillsides! The color palettes were reminiscent of what you might see in Gorman or some areas up in the high desert: tons of poppies, goldfields, lupines, ground pinks, and cream cups - simply stunning! 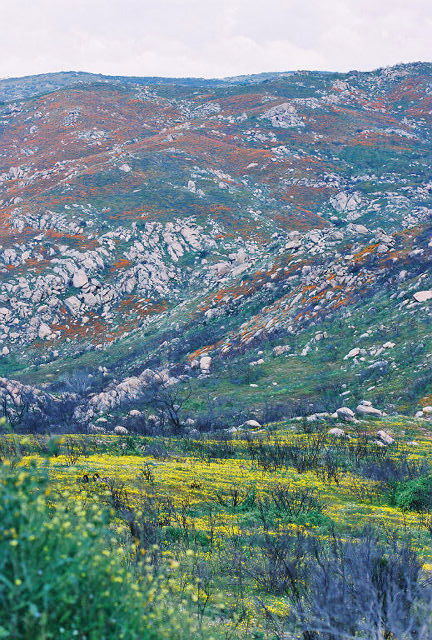 If I remember correctly, '05 was a rainy year, which generally translates to a great wildflower season here in SoCal. 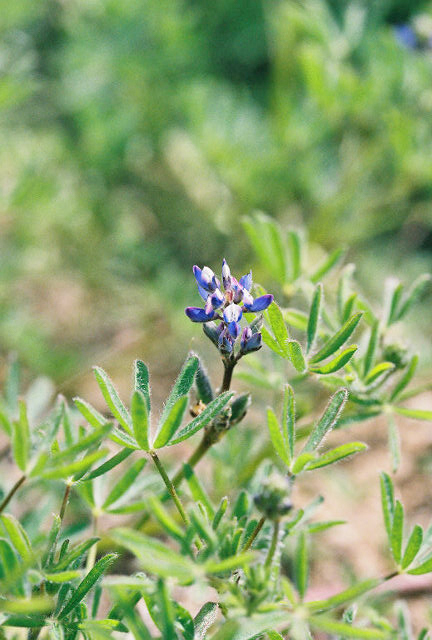 Aguanga is not widely known or advertised as a wildflower haunt, but I think the area is a real treasure trove of botanical delights that is worth exploring and re-exploring. You'll pass Vail Lake along the way, and also a number of campgrounds and trailheads. For history buffs, the drive traverses along the historic Butterfield Overland Mail Stage route. Per Wiki: The town gets it name from a former village of the native Luiseño people called awáanga, meaning 'dog place'. When the Butterfeild Overland Mail established a station there in 1858 it was called Tejungo Station. In November 7, 1861, Lieut. Col. Joseph R. West, mentioned the location was called Giftaler’s or Giftaler’s Ranch, in a journal of his units march to Fort Yuma on the old Butterfield Overland Mail route. In a later Civil War itinerary of the route, it is referred to as the "Dutchman's". 3/6/05 Poppies & goldfields covering the hills on the east side of Wilson Valley Rd. between SR. 371 and Reed Valley Rd. 3/6/05 Gil, looking exhausted handling our rambunctious Hana. Wilson Valley Rd. between SR. 371 and Reed Valley Rd. 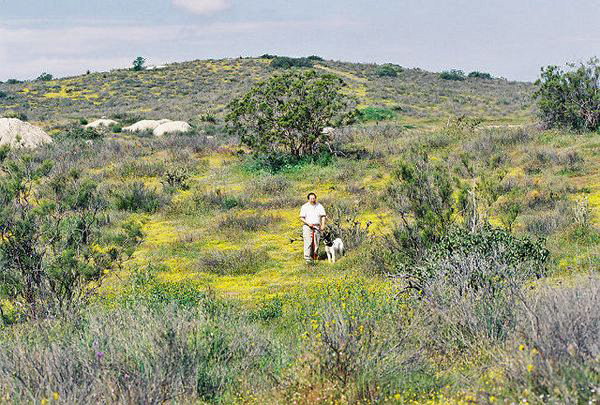 3/6/05 Gil and Hana in a field of Goldfields on a pullout off the west side of SR. 371, near the entrance to a gated private property. 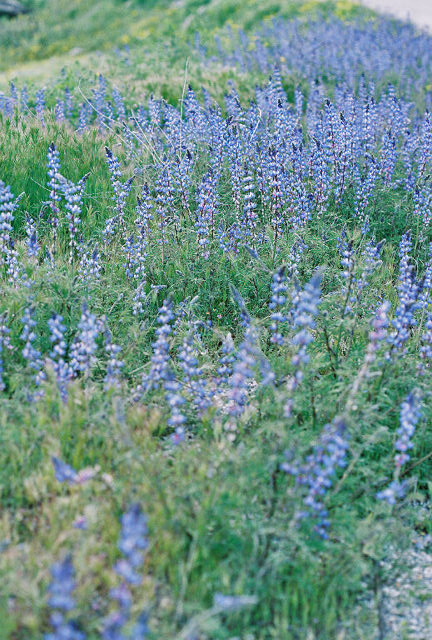 3/6/05 Arroyo Lupine (Lupinus succulentus), roadside off of Wilson Valley Rd. between SR. 371 and Reed Valley Rd. 3/6/05 Southern Suncups (Camissonia bistorta). South side of SR. 79 between call box and Woodchuck Rd. 3/6/05 Slenderpod Jewel Flower (Caulanthus heterophyllus var. pseudosimulans)? ID not confirmed. East side of Wilson Valley Rd. between SR. 371 and Reed Valley Rd. 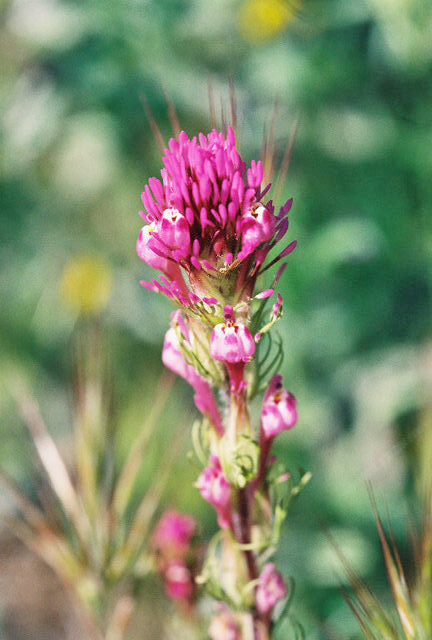 3/6/05 Owl's Clover (Castilleja spp.). West side of SR. 371, near the entrance to a gated private property. 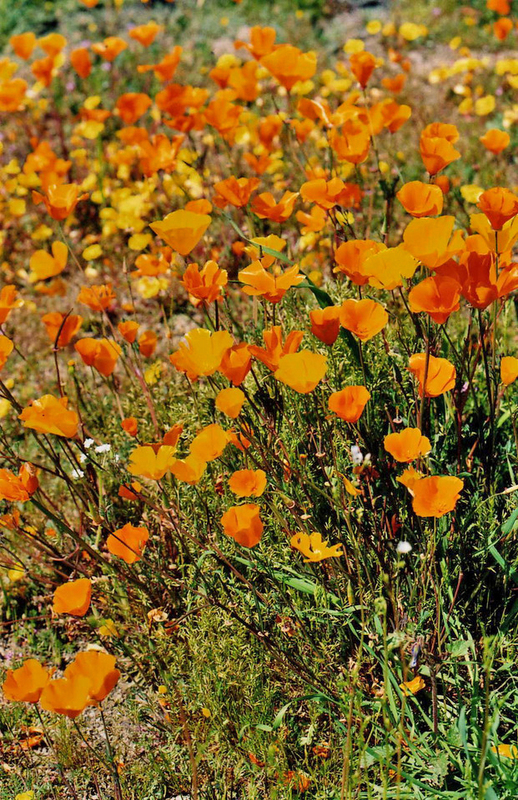 3/6/05 California Poppies (Eschscholzia californica). East side of Wilson Valley Rd., just west of SR 371 junction. 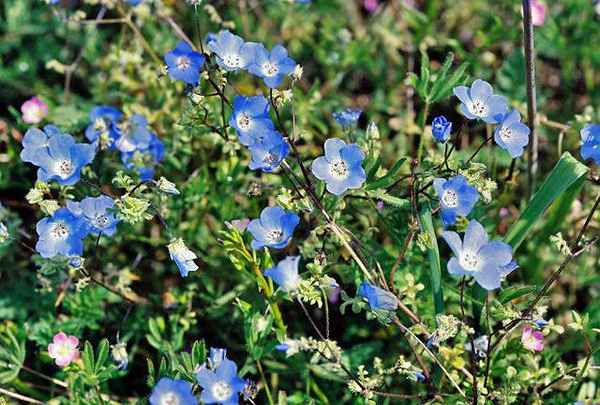 3/6/05 Baby Blue Eyes (Nemophila menziesii). East side of Wilson Valley Rd. between SR. 371 and Reed Valley Rd. 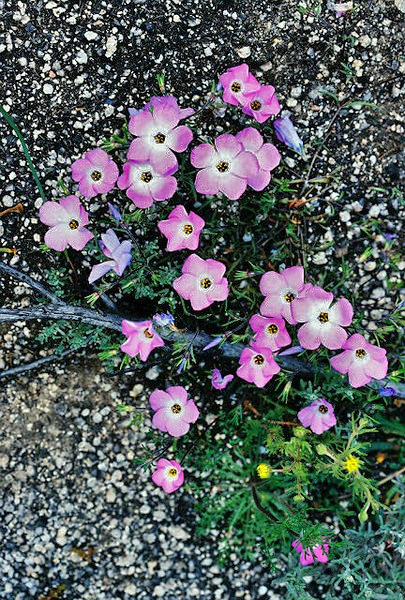 3/6/05 Ground Pinks (Linanthus dianthiflorus). East side of Wilson Valley Rd. between SR. 371 and Reed Valley Rd. 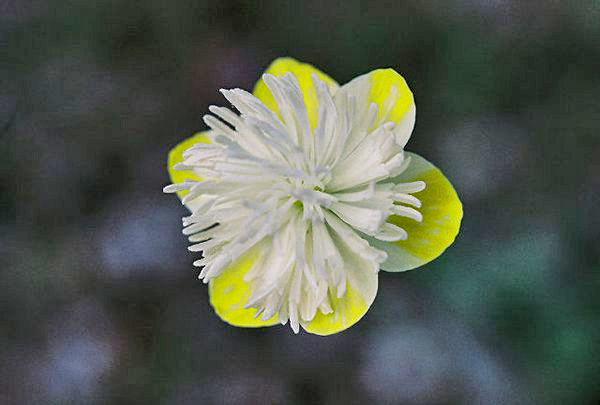 3/6/05 Cream Cup (Platystemon californicus), with a splash of yellow. East side of Wilson Valley Rd. between SR. 371 and Reed Valley Rd. 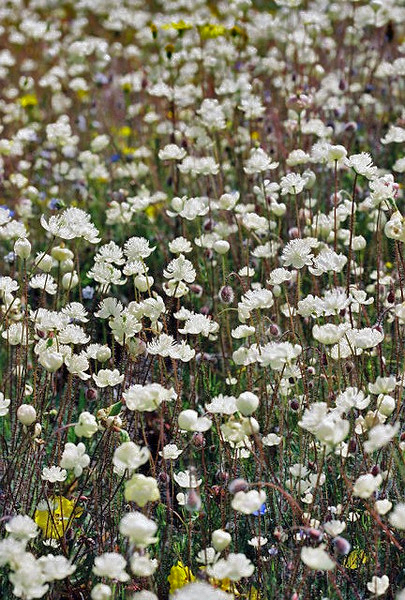 3/6/05 White Cream Cups (Platystemon californicus). East side of Wilson Valley Rd. between SR. 371 and Reed Valley Rd. 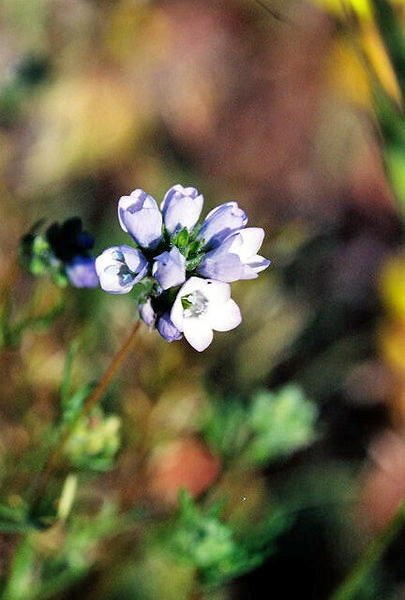 3/6/05 Blue Toad Flax (Linaria canadensis). South side of SR. 79 between call box and Woodchuck Rd. 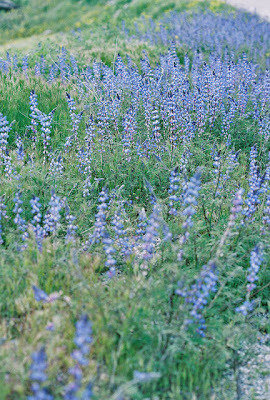 3/6/05 Dove Lupine (Lupinus bicolor), roadside off of Wilson Valley Rd. between SR. 371 and Reed Valley Rd. 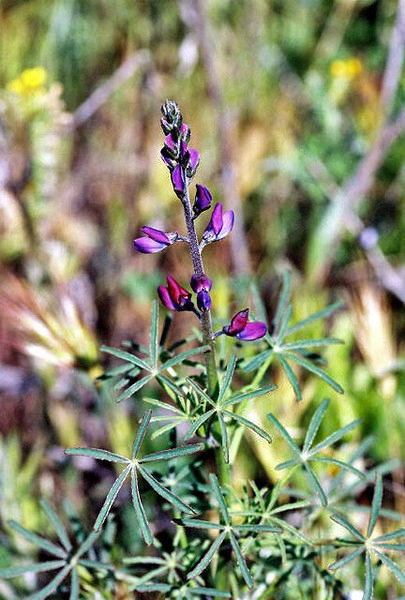 3/6/05 Blunt-leaved/Collar Lupine (Lupinus truncatus). West side of SR. 371, near the entrance to a gated private property. 3/6/05 Angel Gilia (Gilia angelensis)? South side of SR. 79 between call box and Woodchuck Rd. 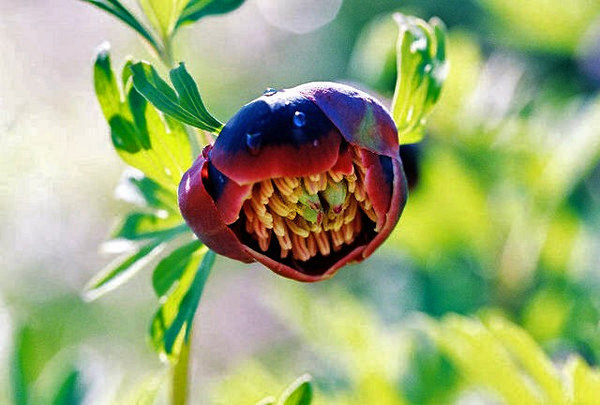 3/6/05 California Peony (Paeonia californica). South side of SR. 79 between call box and Woodchuck Rd. 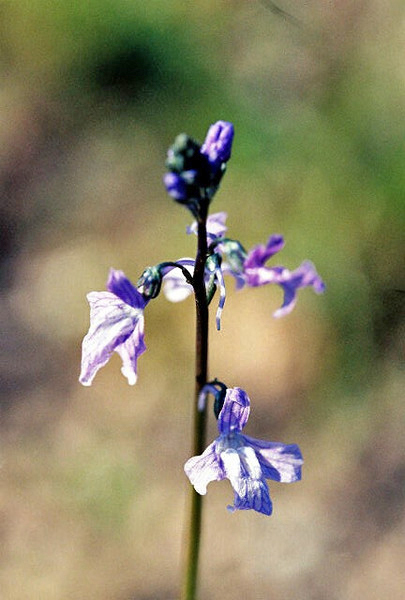 3/6/05 Blue Dicks (Dichelostemma capitatum). South side of SR. 79 between call box and Woodchuck Rd. 3/6/05 Common Eucrypta (Eucrypta chrysanthemifolia). South side of SR. 79 between call box and Woodchuck Rd. 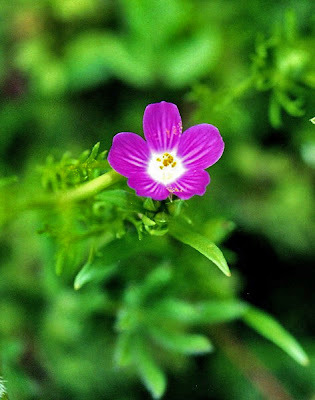 3/6/05 Red Maid (Calandrinia ciliata). South side of SR. 79 between call box and Woodchuck Rd. 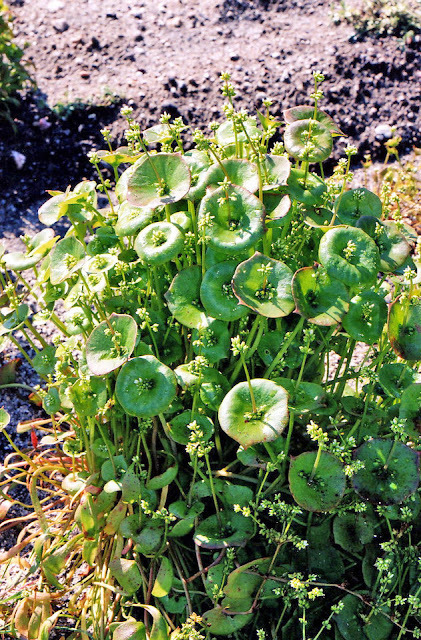 3/6/05 Miner's Lettuce (Claytonia perfoliata). South side of SR. 79 between call box and Woodchuck Rd. 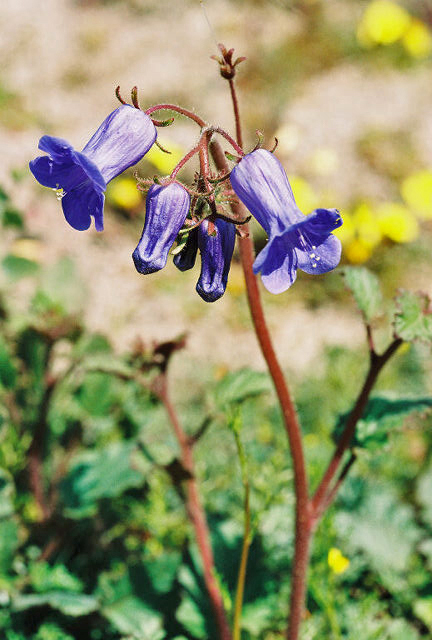 3/6/05 Wild Canterbury Bells (Phacelia minor), east side of Wilson Valley Rd., just west of SR 371 junction. Directions: From I-15 in Temecula, exit SR 79 (Temecula Parkway) and go east. You will pass Vail Lake along the way (there's a nice pullout between a call box and Woodchuck Rd.). At the town of Aguanga, turn left onto SR 371. From there, we basically did a loop drive back to SR 79 by making a left on Wilson Valley Rd., left on Sage Rd., then a right on SR 79. Feel free to stop anywhere roadside along this route where there's room and it looks safe to park. Road Conditions: SR 79, SR 371, Wilson Valley Rd., and Sage Rd. are all paved rural 2-lane roads. We've run into some tailgaters before who didn't like our leisurely (i.e., 45-50mph) pace on the road, so just be aware and let these idiots pass. Pets: Bring Fido with you! Just be responsible and keep your pooch leashed. 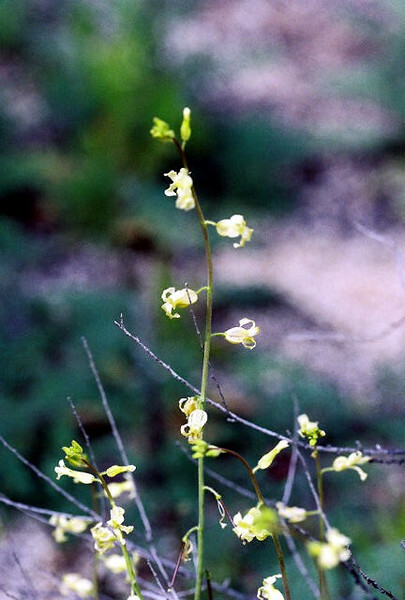 One federally endangered barberry (Berberis nevinii), and two federally threatened plants, slender-horned spineflower (Dodecahema leptoceras), and Vail Lake ceanothus (Ceanothus ophiochilus) occur in the Aguanga Place. 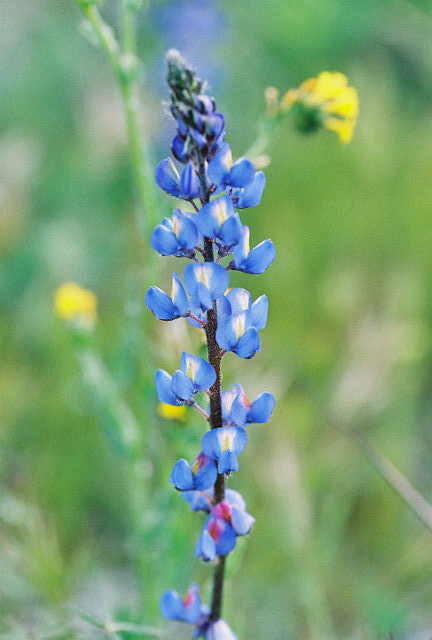 Other sensitive plants include rainbow manzanita (Arctostaphylos rainbowensis) Orcutt's brodiaea (Brodiaea orcuttii), Payson's jewelflower (Caulanthus simulans), Mojave tarplant (Hemizonia mohavensis), Lakeside ceanothus (Ceanothus cyaneus), Orcutt's linanthus (Linanthus orcuttii), Hall's monardella (Monardella macrantha hallii), and San Felipe monardella (Monardella nana leptosiphon). 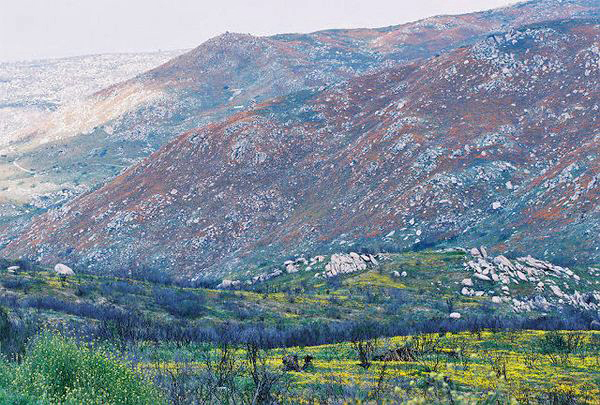 Habitat between the Agua Tibia/Palomar Rangidentified as a link for top carnivores such as mountain lions. 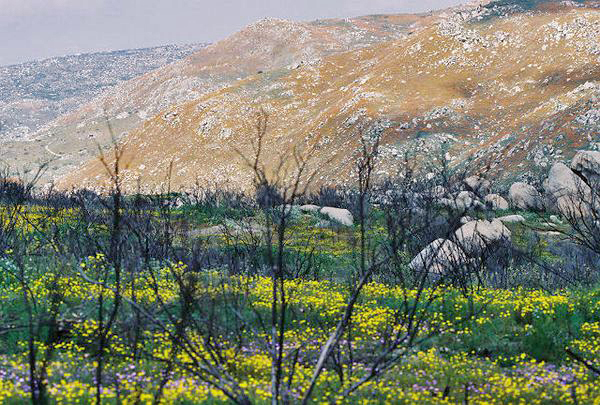 The fragmentation of wildlife habitats is recognized as a threat to the conservation of biodiversity." What we saw: Common Fiddleneck (Amsinckia spp. 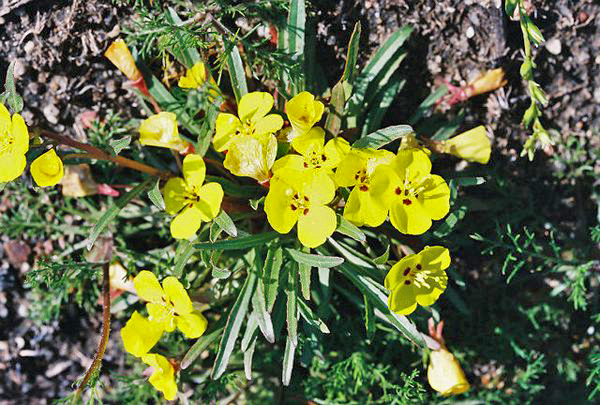 ), Red maids (Calandrinia ciliata), Southern Suncups (Camissonia bistorta), Owls Clover (Castilleja spp. 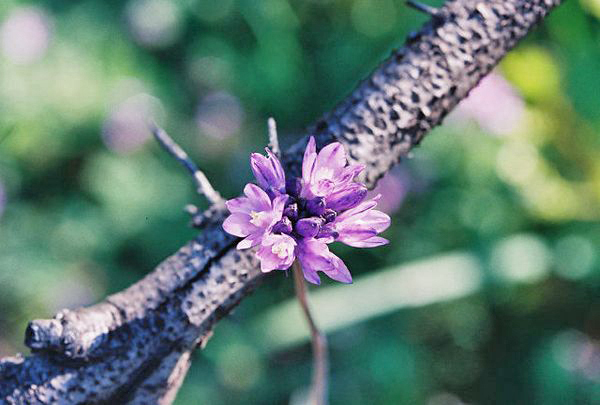 ), Slenderpod Jewelflower (Caulanthus heterophyllus var. 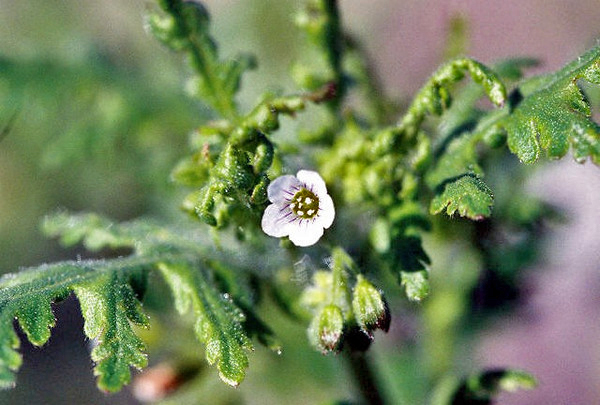 pseudosimulans)*, Yellow Chaenactis (Chaenactis glabriuscula), Miner's Lettuce (Claytonia perfoliata), Tansy Mustard (Descuriana pinnata)**, Blue Dicks (Dichelostemma capitatum), Red-stemmed Filaree (Erodium cicutarium)**, California Poppy (Eschscholzia californica), Common Eucrypta (Eucrypta chrysanthemifolia), Angel Gilia (Gilia angelensis)*, Ground Pink (LInanthus dianthiflorus), Goldfields (Lasthenia californica), Blue Toad Flax (Linaria canadensis), Lotus spp., Dove Lupine (Lupinus bicolor), Collar Lupine (Lupinus truncatus), Arroyo Lupine (Lupinus succulentus), Wild Cucumber (Marah macrocarpus), Baby Blue Eyes (Nemophila menziesii), California Peony (Paeonia californica), Wild Canterbury Bells (Phacelia minor), Cream Cups (Platystemon californicus). I came across your wonderful blog while I was researching the Butterfield Overland stagecoaches route. & Sage. I live in Temecula Wine Country and have been here 17+ years and love to explore the desert.